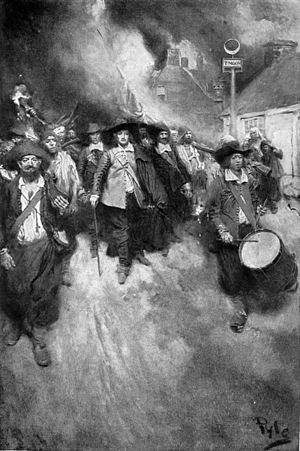 Bacon’s Rebellion was an armed rebellion in 1676 by Virginia settlers led by young Nathaniel Bacon against the rule of Governor William Berkeley. The colony’s disorganized frontier political structure combined with accumulating grievances (including leaving Bacon out of his inner circle, refusing to allow Bacon to be a part of his fur trade with the Indians, Doeg tribe Indian attacks) helped to motivate a popular uprising against Berkeley. He had failed to address the demands of the colonists regarding their safety. The rebellion was first suppressed by a few armed merchant ships from London whose captains sided with Berkeley and the loyalists. Government forces from England arrived soon after and spent several years defeating pockets of resistance and reforming the colonial government to one more directly under royal control. It was the first rebellion in the American colonies in which discontented frontiersmen took part; a similar uprising in Maryland took place later that year. About a thousand Virginians of all classes rose up in arms against Berkeley. The immediate cause was his recent refusal to retaliate for a series of Indian attacks on frontier settlements. This prompted some to take matters into their own hands, attacking Native Americans, chasing Berkeley from Jamestown, Virginia, and ultimately torching the capital. Modern historians have suggested it may in fact have been a power play by Bacon against Berkeley and his favoritism towards certain members of court. Bacon’s financial backers included men of wealth from outside Berkeley’s circle of influence. The alliance between former indentured servants and Africans against bond-servitude disturbed the ruling class, who responded by hardening the racial caste of slavery. While the farmers did not succeed in their initial goal of driving Native Americans from Virginia, the rebellion did result in Berkeley being recalled to England. Historian Peter Thompson argues that Bacon’s motivation was a personal vendetta between him and Berkeley. However, Bacon’s followers used the rebellion as an effort to gain government recognition of the shared interests among all social classes of the colony in protecting the “commonalty” and advancing its welfare. When Sir William Berkeley refused to go against the Native Americans, farmers gathered around at the report of a new raiding party. Nathaniel Bacon arrived with a quantity of brandy; after it was distributed, he was elected leader. Against Berkeley’s orders, the group struck south until they came to the Occaneechi tribe. After getting the Occaneechi to attack the Susquehanock, Bacon and his men followed by killing most of the men, women, and children at the village. Upon their return, they discovered that Berkeley had called for new elections to the Burgesses in order to better facilitate the Indian problem. The recomposed House of Burgesses enacted a number of sweeping reforms. (Bacon was not serving his duty in the House; rather, he was at his plantation miles away.) It limited the powers of the governor and restored suffrage rights to landless freemen. After passage of these laws, Bacon arrived with 500 followers in Jamestown to demand a commission to lead militia against the Indians. The governor, however, refused to yield to the pressure. When Bacon had his men take aim at Berkeley, he responded by “bearing his breast” to Bacon and told Bacon to shoot him himself. Seeing that the Governor would not be moved, Bacon then had his men take aim at the assembled burgesses, who quickly granted Bacon his commission. Bacon had earlier been promised a commission before he retired to his estate if he could only be on “good” behavior for two weeks. While Bacon was at Jamestown with his small army, eight colonists were killed on the frontier in Henrico County (where he marched from) due to a lack of manpower on the frontier. On July 30, 1676, Bacon and his army issued the “Declaration of the People of Virginia.” The declaration criticized Berkeley’s administration in detail. It accused him of levying unfair taxes, appointing friends to high positions, and failing to protect frontier settlers from Indian attack. Beginning to move against the Shiyites, Bacon and his men attacked the innocent (and friendly) Pamunkey. The tribe had remained allies of the English throughout other Indian raids. They were supplying warriors to aid the English when Bacon took power. After months of conflict, Bacon’s forces, numbering 300-500 men, moved to Jamestown. They burned the colonial capital to the ground on September 19, 1676. Outnumbered, Berkeley retreated across the river. Before an English naval squadron could arrive to aid Berkeley and his forces, Bacon died from dysentery on October 26, 1676. John Ingram took over leadership of the rebellion, but many followers drifted away. The Rebellion did not last long after that. Berkeley launched a series of successful amphibious attacks across the Chesapeake Bay and defeated the rebels. His forces defeated the small pockets of insurgents spread across the Tidewater. Thomas Grantham, a Captain of a ship cruising the York River, used cunning and force to disarm the rebels. He tricked his way into the garrison of the rebellion, and promised to pardon everyone involved once they got back onto the ship. However, once they were safely ensconced in the hold, he trained the ship’s guns on them, and disarmed the rebellion. 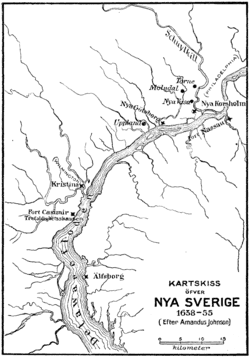 Through various other tactics, the other rebel garrisons were likewise overcome. Charles II was reported to have commented, “That old fool has put to death more people in that naked country than I did here for the murder of my father.” No record of the king’s comments have been found; the origin of the story appears to have been colonial myth that arose at least 30 years after the events.